So, I'm going to say upfront, my husband and I don't do Valentine's Day. Actually, I am the least likely person I know to get preachy about showering your loved one with gifts, romance and a dozen roses. My hubby and I feel that showing how much we love each other can and should be done any day of the year, not just on those days that companies can sell more chocolate and fluffy toys. We are also going through a heavy-duty minimalism stage in our lives, getting rid of anything that we don't use in our space, so I think we both agree that the last thing we need is more stuff! Really I don't seen anything wrong with showering your beloved with gifts. There are worse things that could happen, and it is a very endearing thing to do. But it doesn't take up a lot of space in my family life. I am a happily married mum. But I wasn't always so. Like everyone else, I was single at some point in the past, and many times Valentine's Day came and went with not a whisper of romance. Having said all of that that, love and the heart are big topics in my mindful wellness practice and I think it is worth exploring and celebrating them any day of the year! So, with that in mind, I have decided to feature a heart-opening yoga pose and short meditation in my blog this month. You can do the pose today, or any other day of the year and you will still get the same benefit - connection to your heart, a deep, loving rest, and appreciation for all you love in your life. Some heart-opening poses can be quite strong. Basically, any pose that opens the chest and exposes the heart and throat bring energy to that area. The pose I have for you though is easy and very restorative. People tend to spend a lot of the time with rounded shoulders, sitting at their desk, sitting on the bus, trudging to work with a bag on their shoulder. Rounded shoulders and a caved-in chest are signs of low self esteem, low confidence, stress, and anxiety. Try this easy practice to physically and energetically open your heart. It will take just 5 minutes. It will open you up, but also soothe your heart and mind. 2. 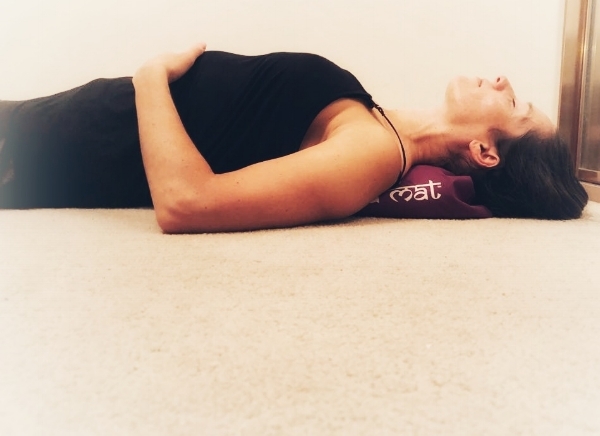 Lie down on your back and place it underneath you so that it will support your back from the bottom of the shoulder blades to the top of your back, and also your neck if you are uncomfortable bringing your head to the floor. 3. Relax the legs out to the side, or bend your knees if you are finding there is too much pressure on your lower back. 4. You can bring your arms above your head on the floor, out to the side, or resting on your belly. 5. Move through your muscles and relax any areas of tightness. 6. Start to focus in on your breath, slow it down. 7. Now bring to mind the special people in your life, family, special friends, a partner if you have one, a pet, and so on. 8. As you breathe in, say to yourself in your mind, "I love", and picture the people you love. 9. As you breathe out, say to yourself in your mind, "I am loved", and picture those who love you. 10. Continue to breathe in and out with this mantra for a few more minutes. Allow your heart to fill with joy and gratitude for the love in your life. Allow your muscles to relax and let your heart fill with love. 11. After some time doing this, return to normal breathing, roll onto your side and gently start moving back into your day. I hope you like the practice. It is a simple but powerful practice to reconnect with your heart and acknowledge the special people in your life. Let me know how it goes for you and if you liked this post, don't forget to Like it and Share it below!